A couple of years back I posted a little about the Alyeskan Outriders, though I didn't post much in the way of details back then. Recent work on a remotely related project and related research means that I am able to present the Outriders in a more organised format. Consider this an update of the original post on the Outriders. 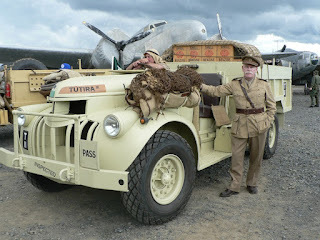 The British Army has contained many famous units throughout its long history, ranging from the 95th Rifles of the Napoleonic era through to the SAS. Counted amongst them is the Gurkhas, Nepalese soldiers who have fought alongside the British forces since the first Gurkha unit was raised in 1815 following the Anglo-Nepalese War. This week we'll be covering the British Army's Gurkha units during the Cold War period, featuring an brief overview of their history, training and some role play material. Prior to the Cold War the Gurkhas had been loyally serving in the British Indian Army for over a hundred years, primarily in the Far East and on the North West Frontier of British India. They also served in both World Wars, but this required a special dispensation known as Pani Patiya. It is believed that crossing the sea means that Gurkhas forfeit their privileges of caste and rights, failing to obtain the dispensation results in heavy punishment. Others who may have unwittingly taken food and water with the transgressor are also placed under the same ban. The First World War saw some 200,000 Gurkahs fight on the Western Front and throughout the Middle East from the Suez Canal to Syria. The Gurkhas won 26 Victoria Crosses during the conflict but lost twenty thousand men, this includes a battalion of the 8th Gurkhas that fought to the last man during the Battle of Loos by hurling themselves time after time against the weight of the German defences. After the war the Gurkhas went back to being peace-time soldiers on the frontiers of India, though they still took part in many conflicts such as the Third Afghan War and the Waziristan Campaign. Went the Second World War broke out the Gurkhas once again sailed across the sea to fight for Britain. They fought from Syria through the Western Desert through to Italy and Greece. In the Far East they fought in Malaya, Singapore, the retreat from Siam and throughout the Burma campaign. At war's end they were involved in various peace-keeping missions including Vietnam after the Japanese surrender until the French returned. They had been in the thick of the fighting against the Japanese in Burma, yet when they arrived in Vietnam they found that the Japanese had been allowed to keep their weapons and eventually the two former enemies fought alongside one another against the Vietnamese nationalists. By 1947 there were ten Gurkha regiments (some twenty battalions) in the 'old' Indian Army, with the Partition of India these were divided between the 'new' Indian Army and the British Army. Six regiments (twelve battalions) were transferred to the 'new' Indian Army whilst the remaining four regiments (eight battalions) were integrated into the British Army as the Brigade of Gurkhas. The Brigade also consists of The King's/Queen's Gurkha Engineers, The King's/Queen's Gurkha Signals and the Gurkha Transport Regiment. The Brigade of Gurkhas would see service throughout the twelve years of the Malayan Emergency and later in Brunei and Borneo during the Indonesian Confrontation. Their HQ and main training base was later established in Hong Kong where the Gurkhas were deployed on security duties that included patrolling the border checking for illegal immigrants entering the territory. They were never allowed to be deployed to Northern Ireland nor they were ever assigned to the British Forces in Germany, but they did take part in the Falklands War. 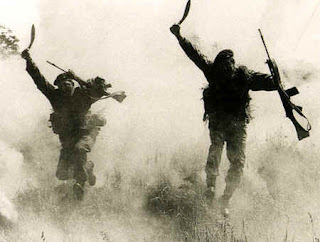 The Gurkhas' reputation preceded them in this conflict in 1982 as the Argentines surrendered rather than fight when confronted by the Gurkhas, even if the Argentines were entrenched in strong positions! During the Cold War period the British Army needed 400 recruits a year for the Gurkhas, every year there were 8,000 young men eager to join. Old soldiers were sent into the hills to do the preliminary selection and whittled it down to 800 potential recruits who were sent to the depots at Dharan and Pokhra for medical and selection. Most of the Gurkha recruits were subsistence farmers scratching out a living at around 7,000 feet, often travelling barefoot for many miles up and down mountains whilst carrying heavy loads. As a result the Gurkhas all have immensely powerful legs, but they are prone to tuberculosis and one of the first tests they have to pass is a chest X-ray. Living in the mountains, thus away from the population and noise of cities, also means that they have excellent eyesight and hearing. Though whilst to Western eyes the Gurkhas may all look alike, the Gurkhas belong to a tribal or clan system which has different dialects and differing physical traits. This often meant that the individual Gurkha regiments recruited from specific areas of Nepal. The small, quick-witted Rais and the taller, slower-speaking Limbus from Central East Nepal formed the recruitment pool of the 7th and 10th Gurkha Rifles; on the other hand the 2nd and 6th took Gurungs and Magars from Central West. Though the stated difference between the two was that the Gurungs had finer features. Those who were accepted were sent via aircraft for ten months training at the Brigade's main base in Hong Kong, something that was often a culture shock for the young Nepalese men. They had to be taught how to live in the modern world and learn English in addition to basic soldiering. The training was tough and maintained a discipline long out of fashion with British regiments. Their accommodation consisted of large wooden huts that were so out of date that for a time the Royal Marines kept one at the Commando Training Centre just to show recruits how rough life was in the old army. Yet the Gurkhas lapped it up and considered it an insult if their training was softened for any reason. Historically there were two types of officers in the Gurkhas; regular British officers and the King's/Queen's Gurkha Officers (K/QGOs). The British officers (of which there were only 17 to a Gurkha battalion) had to attend the two-month Nepalese Language Qualification Course at the Hong Kong training depot and was expected to immerse himself in Gurkha culture and tradition. He was told to never shout at a Gurkha as that would only lower his prestige in the eyes of the Gurkha and he had the responsibility to maintain his own standards, thus develop a mutual relationship of trust with his men. If a Gurkha lost faith in his officer that officer was finished, but once trust is established the Gurkha would follow him to hell and back. The British officers also looked after their men, even going as far as keeping an eye on the men's gambling (which was only allowed during the religious festive of Diwali). Queen's Gurkha Officer sat somewhere between warrant officers and full commissions, meaning they had no authority over British troops and were technically subordinate to any British officer regardless of rank. Most QGOs were typically old hands who had come up through the ranks and served as either platoon commanders or as deputy commanders of companies. A scheme started in the 1950s introduced Gurkha officers commissioned from the Sandhurst Royal Military Academy who were on par with British officers and had greater promotion prospects (one Gurkha became a Lieutenant-Colonel). The main base for the Gurkhas was at Hong Kong, where they were primarily employed on internal security duty (typically picking up fugitives from Communist China), there were other postings and the battalions had a rotation system for these postings. Each battalion spent two years in the UK followed by four years in Hong Kong, two in Brunei and then back in Hong Kong for a further two years before they started the sequence all over again. There were other postings: to the Jungle School in Brunei, to the Demonstration Company at Sandhurst or the Demonstration Company at the NCO Training Wing at Brecon and four-month long postings to Korea where a large platoon of Gurkhas formed the United Nations Honour Guard. Additionally there was something like a thousand Gurkha soldiers in Nepal at any one time, either working at the Dharan base or travelling to and from their homes on leave. Probably the easiest way to use the Gurkhas in Savage Worlds is a bridge campaign between Weird War 2 and Tour of Darkness, covering the post-WW2 period in Vietnam before the French re-occupation and First Indochina War. This would only cover the 1945-46 period but would feature a number of clashes with the Viet Minh, but plenty of Weird Wars elements be can thrown in. For example this would involve trying to beat the Viet Minh to a secret Japanese (or Vichy French) research base located deep in the jungle. A mash-up of Weird War 2 and Tour of Darkness can, to a degree, also be used to cover the Mayalan Emergency and Indonesian Confrontation. The former saw the use of alot of old WW2 era equipment, though the latter would require some conversions from Tour of Darkness. A Falklands War based game would be a little trickier since the Gurkhas never got to see much action (for reasons listed earlier), but the conflict took place over a large part of the South Atlantic and a forgotten Nazi base in the far south could come into play. Equipment wise the Gurkha used standard issue British weapons such as the L1A1 SLR and General Purpose Machine Gun (use M60 stats), though they were also issued with the American M16 depending on the mission requirements. Every Gurkha also carried a kukri, a knife that is similar to a machete and is used as both a tool and weapon in Nepal. Particularly in the Far East the Gurkhas wore Tropical DPM fatigues, this gives them a +1 bonus to their Stealth rolls whilst in a jungle environment. Right, time for the monthly update. With UK Games Expo done and dusted for another year the focus can now be directed once more at Frozen Skies and the other projects that are in the works. 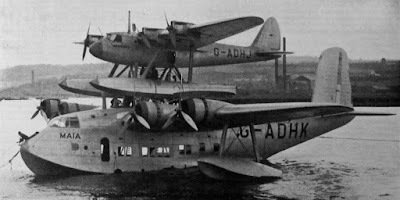 So this week entails progress report on the status of Frozen Skies and some ideas for related projects. The writing for Frozen Skies is now pretty much done, just waiting on a couple of pieces to be proofread and edited before everything is handed over to the layout guy for him to work his magic. There may be one or two extra bits of artwork required, though we'll see since I'm going with artwork for the start of each chapter and portraits of certain NPCs. Depending on how well Frozen Skies does I may look at doing an updated version with extra artwork, but that is largely depends on money flow (which is effecting how much artwork I can currently have). Looking at Frozen Skies being about 130 pages, but it'll certainly be a 7" by 10" softback in addition to a PDF. Release is looking likely to be August time, initially through DriveThruRPG/RPGNow with a view of eventually getting Frozen Skies into game stores. May do a hardback version, but that depends on demand. Likewise looking at doing Frozen Skies for different systems, FATE is one people have been asking for. My last update post I mentioned about other ideas such as producing cards with aircraft on them, thinking of it being a top-down view of the aircraft (like the picture below). 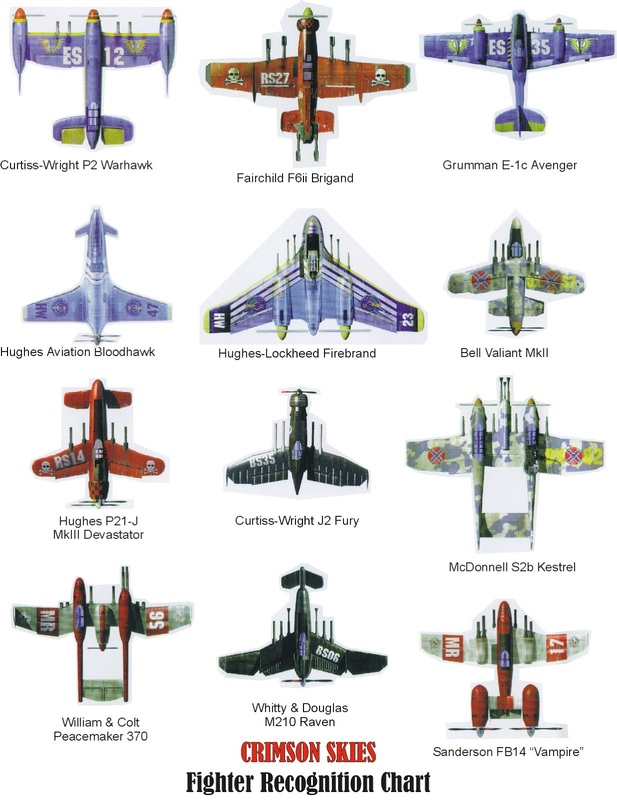 This is something that I'll need to look into, though probably would be a cheaper alternative to miniatures as I can have a few generic planes which can have any stats used with them as well as already 'named' aircraft. Another idea I'm toying with is another adventure for Frozen Skies, it can basically be summed up as Murder on the Orient Express on a flying boat. 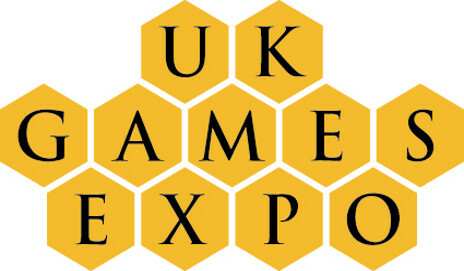 Its been a couple of days since we got back from this year's UK Games Expo. It was good to be back after having to skip it last year and meeting people again, certainly to make sure Utherwald is there again next year. Already plans for next year are being made. This year it was probably the best convention I've had, least with regards to selling stuff. No where near breaking even but a good way towards that goal. In addition I have a few avenues to explore when Frozen Skies is release, mainly to help promote it and get distribution to game stores sorted. Certainly feels like I've raised greater awareness of Frozen Skies and seemingly some follow through sales. But I could've possibly done better. I was sharing with a couple of groups (Exilian and Birmingham Game Designers) and as a result the stand appeared a little cluttered, which may had made it difficult for people to tell what the stand was about and possibly put people off. If I'm sharing with anyone next year I need to make sure Utherwald Press is its own distinct thing and easily identifiable. May go with the same size pitch I had with two tables, though the tables at either end of the pitch to effectively create the impression of it being two separate stands (if that makes sense). Likewise I need to invest in a banner of some description. Frozen Skies should hopefully be released at the beginning of August, just in time for it to be announced at Gen Con. After that it'll be a case of getting it into game stores before starting on the next project, though does hopefully mean I can submit it for next year's UKGE Awards. 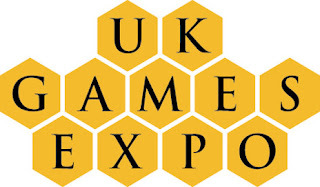 Back from UK Games Expo, will do a blog post later in the week detailing experiences..
Big hello to all the people who've had a look at the blog following Expo. Also, print version of the Frozen Skies Setting Primer is now live!